"For younger kids to see kids their age coming to the library and speak Farsi, it's a good feeling for them and it makes me happy," Sharifan said. "For us coming from another country, [a] sense of belonging to the group is very important." 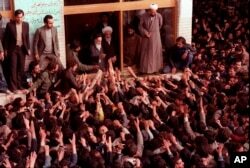 The 1979 Islamic Revolution in Iran overthrew the shah, a close U.S. ally, and installed Shi'ite clerics in power and a government headed by the anti-American Ayatollah Ruhollah Khomeini. Tens of thousands of Iranians fled to the United States.